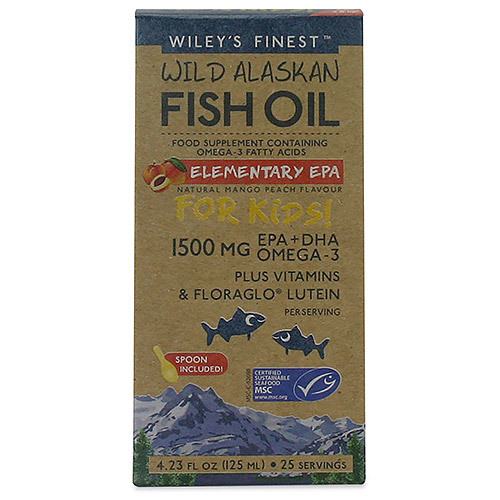 Elementary EPA provides essential vitamins and nutrients often lacking in the diet. EPA and DHA omega-3s along with vitamins and nutrients fuel your child’s healthy brain and support their eyes for optimal focus and function. Featuring FloraGLO®, the most studied lutein available worldwide. Vitamin A contributes to maintenance of normal skin and the normal function of the immune system. What`s That Colour? Lutein and zeaxanthin are brightly coloured antioxidant nutrients. They stain easily, so be careful not to spill on clothing! There`s a Spoon for That! Elementary EPA is easy and pleasant for children, ages three years and up, to take with the provided spoon. Keep it Cool! Like all fish oils, they are delicate and sensitive to heat. Add to yoghurts and smoothies and only add them to hot foods after heating. Purified & Concentrated Alaska Pollock (Fish) Oil triglycerides, Identity Preserved Non-GMO Vitamin E (Sunflower), Natural Mango and Peach Flavours, FloraGLO® Lutein in Safflower Oil, Zeaxanthin in Safflower Oil, Vitamin D3 in medium chain triglycerides. As a food supplement, take one teaspoon (5ml) daily with food. 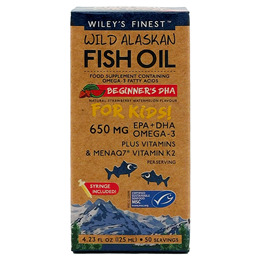 Below are reviews of Wiley`s Finest Wild Alaskan Fish Oil - Elementary EPA for Kids - 125ml - Best before date is 30th June 2019 by bodykind customers. If you have tried this product we'd love to hear what you think so please leave a review.